Welcome to St. Simons Island, Georgia! St. Simons Island is the largest of the Golden Isles along Georgia’s southern Atlantic coast. At 18 square miles in size, it is accessible by car via the F.J. Torras Causeway. 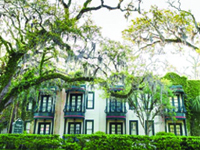 St. Simons has a wide array of lodging choices ranging from stately hotels to comfy B & B’s. Golf resorts, condo rentals and vacation homes round out your choice for a spectacular St. Simons Island vacation. Make sure you bring or rent some bikes to explore, up close, all the beauty the island offers. And being an island, make time for some water sports and quality beach time. Plan a trip to St. Simons Island to enjoy breathtaking ocean views, fresh seafood and so much more! Discover the magic of a St. Simons Island rental home, villa or condo and enjoy the ultimate in privacy and convenience. St. Simons Island restaurants have earned a distinct reputation as some of the best dining options in the South. 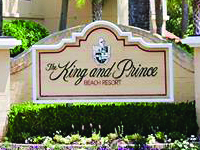 St. Simons Island hotels, inns and motels offer the ideal family vacation or the perfect romantic getaway.